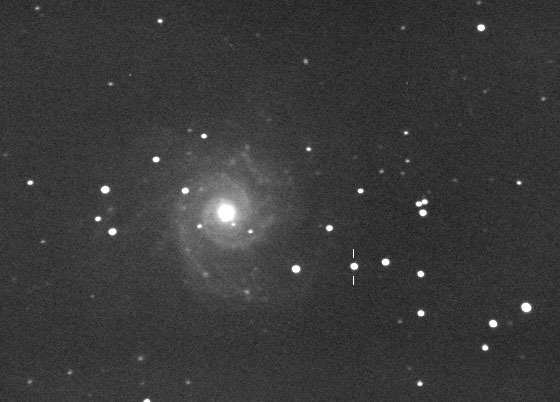 On 25.5 July 2013 the Lick Observatory Supernova Search reported a possible supernova in Messier 74. 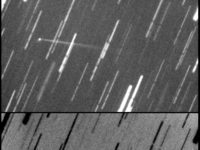 On 28.02 July, the Celestron c14 robotic unit was slewed to that transient, confirming it, despite the very strong interference of a waning Moon within 20 deg from M74. 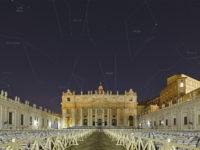 A report was sent to the central Bureau for Astronomical Telegrams (CBAT), which issued the CBET 3606 circular, announcing the discovery, including the contribution from the Virtual Telescope. 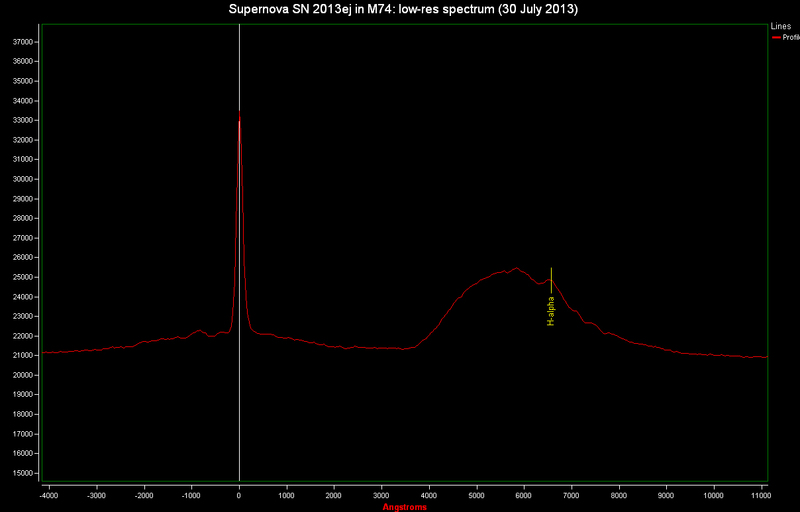 The supernova was quite bright (mag. 12.8 R unfiltered), at this time being the brightest supernova in the sky in apparent magnitude. Spectroscopy showed this was a type II supernova. 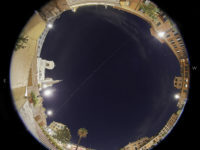 It is now called SN 2013ej. 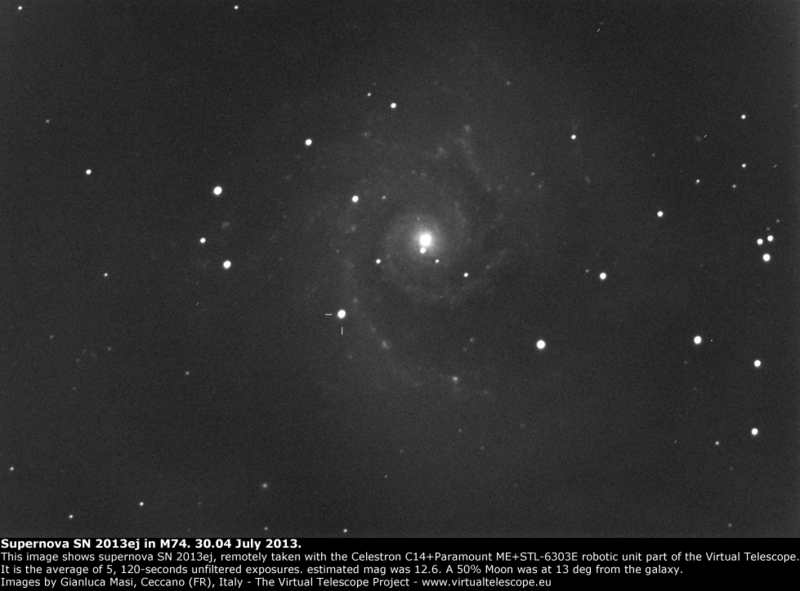 Above is an image taken on 30 July 2013 and it shows SN 2013ej very well, shining at mag. 12.6 R, unfiltered. 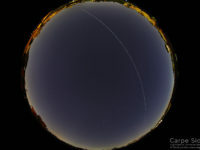 The same night, the 100 lines/mm diffraction grating available on the Celestron C14 was used to capture 10, 300 seconds exposures, to try to capture a spectrum of the source. 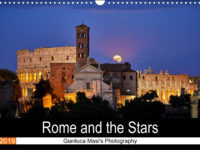 While the Moon was still a issue, there was enough signal to get usable data. The resulting spectrum is below and it shows clear emission at the H-alpha wavelengths, confirming this is a type II supernova. Spectrum was reduced with RSpec. 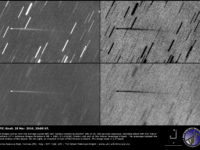 Next story Near-Earth asteroid 2003 DZ15 close encounter: an image and a video for a great event!